The Nixie Watch is another brilliant example of someone taking old technology and building something eye-catching and unique. In this case the old technology is the nixie tube, which you would have surely seen in a 1950s or 1960s film, in an evildoer’s undersea lair, a spy’s gadget supplier, or a NASA lab. Inventor David Forbes has places two nixie tubes into a hard-anodised aluminium case and under a mineral glass cover, along with some solder and circuit board. The Nixie Watch is powered by a lithium disposable battery, that should power the watch for around four months if used daily. Less if you’re showing it off lot. The watch displays only the two numbers, cycling through hours and then minutes, in either 12 or 24 hour time. You’re also able to set the angle of tilt at which the watch display, via the Nixie Watch’s inbuilt tilt mechanism. It’s not a svelte watch by any stroke, but it is slice of dead cool, back-to-the-future space age design. Steampunk-lite, if you will. 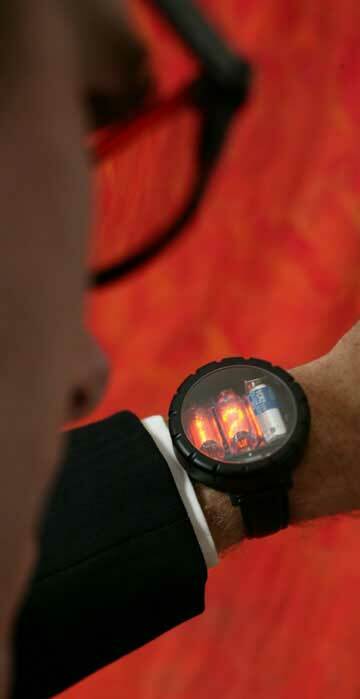 The Nixie Watch is available from inventor David Forbes’ website, Cathode Corner. It costs US$395 plus US$15 shipping to the USA , or US$395 plus US$35 shipping to rest of world. Delivery takes 2 to 3 weeks. While you’re there you could order spare nixie tubes, US$10 each. You just know that Apple co-founder Steve Wozniak would love the Nixie Watch. In this video he gives the crew at megadget a look at his Nixie Watch, which he has told interviewers is a gadget he would have like to have invented. This next video, just over 4 minutes long from Techmoan, gives you not only a more in-depth review of the watch, it also provides a great background, the history of the nixie tube. Love to see your comments on this, a little further down the page, under ‘Leave A Reply’. What do you think? Is the Nixie Watch a slice of great and thoughtful design, or is it simply a hard-to-read relic?